Mess with this Dragon and Feel the Burn! Things are heatin' up! 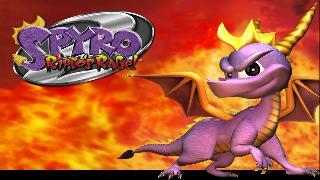 Spyro, the feisty fire-breathing dragon is back and he's ready to take on a whole new adventure. New tasks to complete, puzzles to solve, beautiful new worlds to navigate and hidden areas to discover. Use new moves like powerflame, supershot, high speed underwater swimming, superfly, superfreeze, hover gliding, headbash, climb, and more! Play hockey, fire cannons ride a shark sub, herd strange beasts, go target shooting, and defeat ravenous dinosaurs. More then 30 amazing 3D worlds including action-packed Boss rounds and more then 100 new characters. Now you can add videos, screenshots, or other images (cover scans, disc scans, etc.) for Spyro 2 Ripto's Rage! Demo [U] [SCUS-94460] to Emuparadise. Do it now! If you haven't noticed yet, we have a retro game of the day feature (top-right of the screen) wherein we feature a new retro title every single day! Now, you can vote for your favorite games and allow them to have their moment of glory. Click on the button below to nominate Spyro 2 Ripto's Rage! Demo [U] [SCUS-94460] for Retro Game of the Day.